Get enough folic acid Ideally, you need 400 micrograms of this B vitamin daily before conceiving. Because sufficient intake in the first trimester reduces neural-tube defects such as spina bifida by 50 percent to 70 percent, you should increase the dose to 600 micrograms when pregnancy is confirmed. Recent research suggests that supplementing with folic acid for a year before pregnancy and in the second trimester may also reduce the risk of preterm delivery. Don’t “eat for two” As many as half of women gain too much weight during pregnancy. The upshot: an increased risk for preclampsia, gestational diabetes and delivery of either a preterm or a too-large baby. Eat your fish Getting enough DHA (found in abundance in seafood and flaxseed) is one of the most important things you can do for your and your developing baby’s health, nutritionists say. DHA is the omega-3 fatty acid that can boost your baby’s brain development before birth, leading to better vision, memory, motor skills and language comprehension in early childhood. Eat at least 12 ounces a week of low-mercury fish, or take a DHA supplement (both are safe). Avoid alcohol Behavior problems, learning disabilities, attention deficit disorder, hyperactivity and aggressive behavior in children can result when mom drinks during pregnancy. No amount of alcohol has been shown to be safe. Ban bacteria To protect your baby from harmful bacteria such as Listeria, Salmonella and E. coli (any of which can, in severe cases, cause miscarriage or preterm delivery), steer clear of soft cheeses made with unpasteurized milk, as well as raw or undercooked meat, poultry, seafood or eggs. Keep your fridge below 40° F, and dump leftover food that’s been sitting out for more than two hours. Weight gain is one of the most positive signs of a healthy pregnancy. 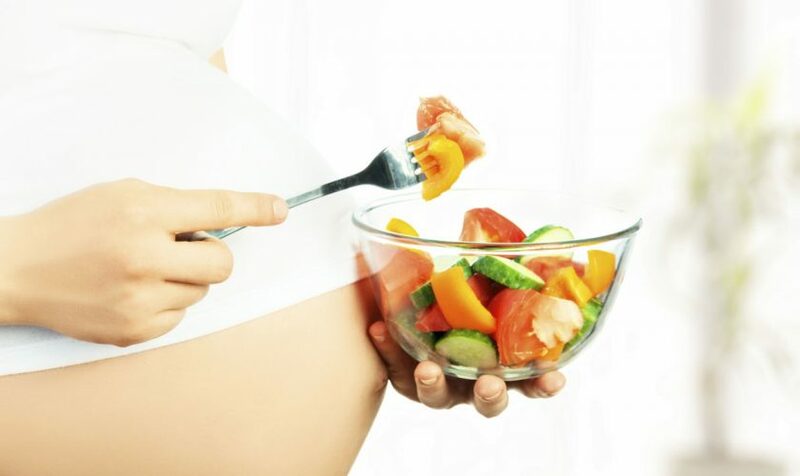 Women who eat well and gain the & appropriate amount of weight are more likely to have healthy babies. If you’re eating wholesome foods and slowly adding pounds, you can rest assured things are most likely on track. When a mother-to-be is experiencing morning sickness, the biggest mistake she can make is thinking that if she doesn’t eat, she’ll feel better, Krieger said. The exact causes of morning sickness are not known, but it may be caused by hormonal changes or lower blood sugar, according to the Mayo Clinic. It can bring on waves of nausea and vomiting in some women, especially during the first three months of pregnancy. And “it’s definitely not happening only in the morning,” Krieger said. “It’s any time of day.” It’s better to eat small amounts of foods that don’t have an odor, since smells can also upset the stomach, she suggested. It is common for women to develop a sudden urge or a strong dislike for a food during pregnancy. Some common cravings are for sweets, salty foods, red meat or fluids, Krieger said. Often, a craving is a body’s way of saying it needs a specific nutrient, such as more protein or additional liquids to quench a thirst, rather than a particular food, she said. When people say that a pregnant woman is “eating for two,” it doesn’t mean she needs to consume twice as much food or double her calories. “A woman is not eating for two during her first trimester,” Krieger said. During the first three months, Krieger tells women that their calorie needs are basically the same as they were before pregnancy, because weight gain is recommended to be between 1 and 4 pounds in this early stage of pregnancy. Krieger typically advises pregnant women to add 200 calories to their usual dietary intake during the second trimester, and to add 300 calories during their third trimester when the baby is growing quickly. “Weight gain during pregnancy often has an ebb and a flow over the nine months,” Krieger said. It’s hard to measure where pregnancy weight is going, she said, adding that a scale does not reveal whether the pounds are going to a woman’s body fat, baby weight or fluid gains. When it comes to pregnancy weight gain, Krieger advises mothers-to-be to look at the big picture: During regular prenatal checkups, focus on that the baby is growing normally rather than worrying about the number on a scale. The total number of calories needed per day during pregnancy depends on a woman’s height, her weight before becoming pregnant, and how active she is on a daily basis. In general, underweight women need more calories during pregnancy; overweight and obese women need fewer of them. Underweight women, who have a Body Mass Index (BMI) below 18.5, should gain 28 to 40 lbs. (12.7 to 18 kilograms). Normal weight women, who have a BMI of 18.5 to 24.9, should gain 25 to 35 lbs. (11.3 to 15.8 kg). Overweight women, who have a BMI of 25.0 to 29.9, should gain 15 to 25 lbs. (6.8 to 11.3 kg). Obese women, who have a BMI of 30.0 and above, should gain 11 to 20 lbs. (5 to 9 kg). The IOM guidelines suggest that pregnant women gain between 1 and 4.5 lbs. (0.45 to 2 kg) total during their first trimester of pregnancy. 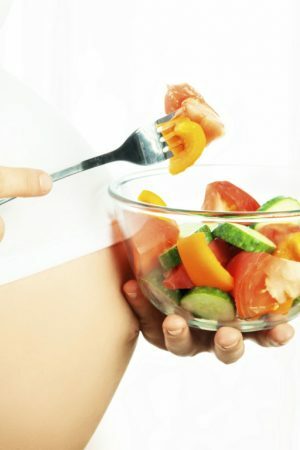 The guidelines recommend that underweight and normal-weight women gain, on average, about 1 pound every week during their second and third trimesters of pregnancy, and that overweight and obese women gain about half a pound every week in their second and third trimesters of pregnancy. Normal weight: 37 to 54 lbs. (16.7 to 24.5 kg). Overweight: 31 to 50 lbs. (14 to 22.6 kg). Obese: 25 to 42 lbs. (11.3 to 19 kg).